At Sinnis, we like to offer you a good and fair range of preferred insurers. More often than not, price comparison sites are not the best place to go to insure your new ride, in fact, calling insurance companies direct can save you money, time and a headache. First thing to do is speak to your Sinnis dealer about who they recommend for insurance, they often have accounts set up with insurance companies and will give you the best prices. If your dealer doesn't have an account setup, you could try one of our recommended insurance companies below. Calling is the better option as quotes can be more specifically tailored for you, meaning bigger savings. In the end the choice is always yours and we in no way are affiliated with any insurance provider. If you are still having problems, you can always call us at Sinnis for advice on (UK only) 01273 020961. We recommend BikeSure insurance over most others, due to providing Sinnis owners with the best five star service (based on customer feedback survey) in the last 2 years. In order to receive the best quote you need to call Bikesure and quote reference number G3772, this will allow them to give you the best Sinnis quotation. 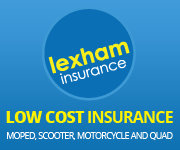 Other companies include MCE Insurance, Swinton and Lexham. They all agree that for the best price, using a comparison site like “Go Compare” or “Confused” will not save you money, and in the end leave you coughing up your hard earned cash for equal cover that would cost you less by picking up the phone. Click on a logo to visit their site.